Just about every town and village in the land has its war memorial, and Hertford is no different. It will be well known to everyone in the town, but it is also unusual because not all of those people commemorated were servicemen. One corner of the memorial is reserved for nine names of people who died on the streets of Hertford itself – killed in an air raid on the town. Such deaths would not have been unusual in the Second World War, but what stands out here is that this plaque sits alongside the names of those who died in the trenches a generation before. These people died in an air raid during the First World War. The air raids over south-east England and East Anglia between 1915 and 1918 are largely forgotten today. Carried out initially by Zeppelin and other airships, and later primitive bombers, in comparison with both the huge numbers killed on the continent, as well as the destruction caused by air raids conflicts that were to come, the damage done was insignificant and the death toll tiny. However the psychological effect at the time on a country that had seen no military conflict on its soil for near 200 years was profound, and the horror and outrage caused by the idea that civilians were being targeted was huge. On the other hand for the Germans it was a huge propaganda boost – the enemy was trying to starve them was being hit. The capital, industries and ports of Empire could be reached. But what had this to do with Hertford? Hertford is not part of London – or anywhere near. It had no port or other significant military target. Why, on the night of the 13th October 1915, did the First World War come to Bull Plain and The Folly? Truth be told, of course, air navigation was not an exact science in 1915 – least of all at night when the raids took place (huge slow-moving airships full of hydrogen would have been easy targets in daylight). Electronic aids like radar did not exist – this would be navigation by the stars, and dead reckoning. This particular night Oberleutnant-zur-See W Peterson in charge of Imperial Navy Zeppelin L16 was part of a group of five craft which arrived off the coast of Norfolk together at around 7.30pm. They took their bearings from Cromer and Great Yarmouth, and then waited for it to get dark. At a height of around 6,500 feet they then set off for their target – London. However, as soon as they crossed the coast they were detected by searchlights and guns and as a result had to scatter and fly higher. Soon all five had lost touch with each other and were – indeed – lost. Only one, L15, found London at all. The other four would have tried to check their positions with light bombs, or hoped to see some features on the ground – like towns or rivers. It was a clear night – and even though it was not a full moon some areas of open water would have shown up. Towns, even with gas light, would have also been visible – though not necessarily easily identifiable. Oberleutant Peterson and his crew would have looked down desperately hoping to see something that would show them where they were. Then they saw it – a ribbon of water curving in a way that meant it must have been the Thames. L16 moved among the river until lights came into view below. This had to be the east end of London, with its ports and factories – L16’s main target! Peterson dropped his 48 incendiary and explosive bombs, and headed for home reporting a successful raid on industrial and railway targets in east London. Unfortunately he was wrong. The river was not the Thames, it was the Lee, and this was not London – it was Hertford. The first bombs from the L16 dropped on the Folly – the little island, surrounded by water from the Lee Navigation, in the centre of Hertford. In the local pub (The Old Barge), there are one or two photos of the damaged caused here. The L16 then moved on to nearby Bull Plain. Here, more bombs fell and exploded by, what was then, the Conservative Club – a 16th century building called Lombard House (today, Hertford Club). Four men were stood at the gates of Lombard House, watching the raid, when they were killed by one of the bombs; one casualty here was James Gregory, the county surveyor. Further explosions severely damaged houses at 25, 27, and 29 Bull Plain, (West end of the street). Moving north Old Cross was hit next. Incendiaries damaged three houses, where some of the injured were badly burned. Houses were also damaged at nearby North Road where Acting Bombadier, Arthur John Cox, 1626, 2nd/1st Norfolk Bty. East Anglian Bde., Royal Field Artillery aged 21, was killed (the only military casualty). Cox’s next of kin buried him in his home at Great Yarmouth (Caister) Cemetery, Norfolk. A high explosive bomb fell immediately outside the gates of Hertford County hospital. Two workmen, standing in Garrats Mill Yard, across the road from the hospital were killed. The blast smashed most of the windows in the hospital: the noise was so loud that a woman in a street nearly half a mile away, is reputed to have died from shock. A baby boy was also killed by shrapnel from the bomb blasts. The attack lasted just less than two minutes. For people who would still have looked on any form of flying machine as being astonishing, and in a town where the loudest noise would have been the pubs at closing time (a new concept in itself), the level of shock must have been astonishing. This page was added on 21/10/2012. My paternal grandmother, Florence Matthews, was nursing at Hertford hospital at this time. My father, now 93, remembers her talking about this incident and saying that they couldn’t get out of the front door of the hospital. As far as we know she suffered no ill effects from the blast. In the process of transcribing an old tape for the Hertford Oral History Group. It’s Mrs Annie Inman and she describes the raid in some detail. She was working in a house in North Road with her sister and they had just arrived back in the house in time. They had been watching the Zeppelins on their journey from Ware Road. I have recently bought an old postcard that was made by Sneesby’s of Fore Street, Hertford. 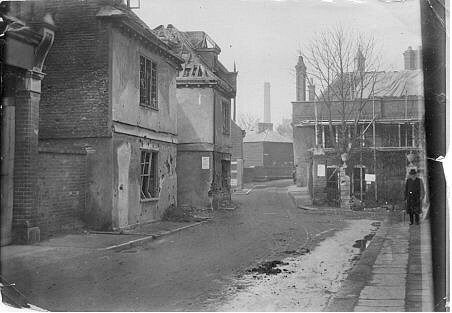 It shows bomb damage in Hertford. As Sneesbys were only in Fore Street from 1914 – 1926 one can,therefore, assume that the postcard relates to WW1 and the Zeppelin raid of 1915. There was a second link between Mr Gregory and Christ’s Hospital girls’ school in that he married Miss Roden, who was a full-time teacher at the school. Both were very popular and highly respected by the Bluecoat girls. I would like to just make a small correction to a very interesting article: the Borough Surveyor was Mr. J H Jevons. Mr J L Gregory (my husband’s grandfather) was a Batchelor of Music from Trinity College, London and taught music privately and singing at the Blue Coat School and the Grammar School, and was organist and Choirmaster at All Saints Church. This article reminds me that somewhere around the house I have a postcard that I bought from an antiques fair several years ago. It is an image of London Road and the New River in Ware and it has had a cross marked on it in pen. It is from a Ware lady to a relative in Oxfordshire and it describes how the lady was “bounced in her bed” at the dropping of a bomb from a zeppelin. “We was terrified” she wrote. The cross marked the spot where the bomb had fallen.